The most common error in written English among educated people, in my opinion, is the interchangeable use of "it's" and "its". Spotting it in the very second line of a screenplay by Peter Morgan (writer of Oscar-nominated screenplays - "The Queen" and "Frost/Nixon") was definitely disappointing for me. However, the error, and it repeated itself on two-three occasions, perhaps remains the only problem I had with this wonderfully inspiring and involving screenplay. The writer, in an interview on the film, says - "Sometimes you have the good fortune to stumble upon characters whose voices you just — hear." Most screenwriters would give anything to have such "fortune" and in Morgan's case it was almost destined. Of German origin, he spent the larger part of his life in Britain, finally moving to Austria with his wife. And here he writes about the real-life rivalry of an Englishman and an Austrian F1 racer during the season of 1976. It is almost envious that he was introduced to Niki Lauda, the above-mentioned world-champion from Austria, by his wife over an informal family lunch. All writers are constantly looking for powerful stories and to find one over a family affair is almost divine providence. But then, it is what the writer does with that inspiration and how he shapes up the story that determine whether the story turns into an inspirational tale or a wasted opportunity. For someone possessing the talent, experience, and success like Morgan, the motivation to write this story must have been naturally powerful - there wasn't really much for him to go wrong. Not having much interest in or knowledge of Formula 1 racing must not have been too much of a deterrent, because as writers we constantly take plunge in unknown territories if we find a universally appealing story in the midst of that world. In the case of the F1 scene in the year 1976, the course of the events were anyway the material of a film, waiting to be discovered and retold by a competent writer. And the proximity with Lauda was a definite advantage. So yes, Morgan was lucky. But the success of the script goes beyond this factor. It is always tricky to write a film based on real characters and true events, as I wrote a few months ago in this post. The biggest challenge is to create a dramatically powerful script without deviating too much with the truth of events as they took place. The main triumph of "Rush", the screenplay, is achieving that rare balance. Not that there is no scene in the film that appears implausible. I find it difficult to believe that James Hunt would punch a British Journalist to teach him a lesson after he asked Lauda a humiliating question about his marriage, although I completely loved that moment. Also, Hunt coming to know about his wife's affair from the mouth of Lauda on the race track did not seem too convincing to me. But the real Niki Lauda has applauded Morgan for a surprisingly true portrayal of the events and "Rush" does not come across as a script that twists facts too much for the sake of adding more drama. And I think the biggest reasons that have contributed to Morgan's success are the way he has used spoken lines to create the wonderful characters of the two protagonists (I like to believe it is a film with two protagonists, despite the recently-announced Golden Globes nomination claiming Daniel Bruhl to be a supporting actor), often giving them unforgettable moments and powerful scenes, and also the way he has structured the film. Finding the right structure is important for any story being told on screen, but more so for a real story. Unlike a complete fictional tale you cannot modify details to create your climax out of nowhere. In a true story, the climax, as the set-up, is already there, waiting to be discovered, and it is the most appropriate structure that gives you that. "I imagined the movie as one big grand prix, with Hunt and Lauda taking turns to pass one another. The screenplay is constructed as a series of overtaking maneuvers" says Morgan about the structure of his script, and this marriage of the most appropriate form with the content, in my opinion, has made the screenplay so successful. It is funny because while and after reading the final thing you cannot fathom that the writer would have experimented with other options for the story's structure - so "correctly" structured this screenplay is. And of course there are little gems that show the kind of research Morgan must have done for his writing. At times it is as on the face and expository as a commentator naming all major F1 drivers who lost their lives in the past five years. And then at other times, it is as beautifully interwoven into the "cinema" of the story as the moment when, before the climactic Japanese Grand Prix, Lauda stares out of the window to notice that Mount Fuji is not visible in the rains. "The locals here believe if you can see the mountain in the morning, it brings good luck", Lauda says, creating not only an ominous foreboding to the dangerous race that has to follow, but also adding effortless emotional value to this very important climactic battle that is to determine the champion of the season. Morgan decided to write this film as a spec script. Perhaps that explains why there are so many "non-filmable" scene descriptions in it. Or perhaps Morgan always does that, with all his films - I'll have to read his other works to figure this out. Frankly, although I am uncertain I would do that as a writer, I didn't mind that, except may be in the opening page, because I am so emotionally invested in the film that a few such lines as "NIKI screams inside. Wanting to be heard. Wanting to give them a sign." (while describing a comatose Niki Lauda) did not trouble me much. Also noticeable is Morgan's conscious deficient descriptions and dialogue during certain moments, especially during the chaos of too many people talking - commentators, media guys, and so on. 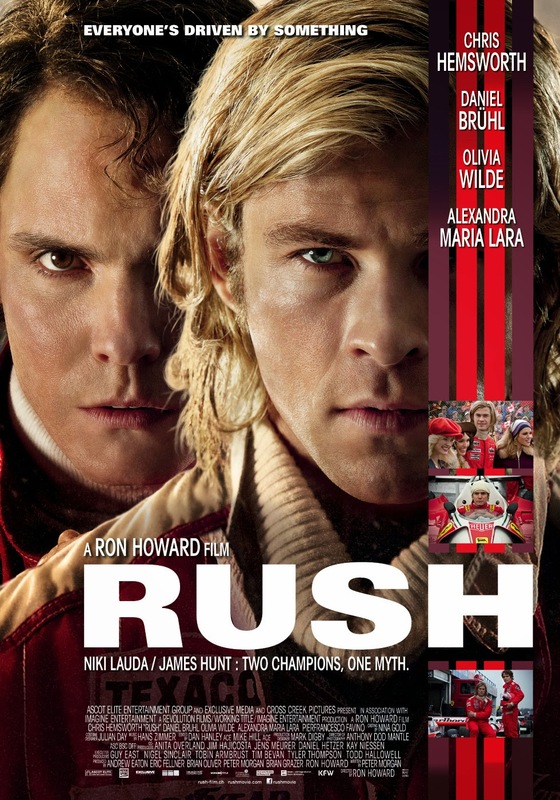 "Rush" succeeds as a screenplay. And, personally, it will remain one of the most powerful tales of ambition, and the drive to succeed. I constantly find myself questioning my academic and method-oriented approach with respect to a more natural and intuitive one that various creative people are blessed with. I could completely relate to Lauda's obsession with little details, his single-minded discipline, his almost boring logical and calculative personality, and his lack of charm despite the impressive and incomparable intelligence. And like Lauda, I did envy the personality and the pleasures that Hunt so effortlessly possessed. Perhaps Lauda took solace in his clinical approach, because deep within he knew he could never be James Hunt. But he knew that being Niki Lauda was good enough, and he just assured that with his way of life. Could anyone turn an insult to a compliment for himself the way he does in these lines? "Relentlessness is good. Means you're a fighter. That you never give up. Behind my back I know some of you guys call me 'The Rat.' Because I look like one. It's meant as an insult. But I don't mind it. Rats are ugly, sure. And no one likes them. But they're intelligent. With a strong survival instinct." Nicely written. Love the parts where it becomes exclusively a 'Screenplay Review' and goes into the tools employed by the writer more than how it really played out in the film. Potential option for a new series of reviews.